When I got to the venue, the quirky Nadine Legaspi welcomed me to the event! Although I intended to take this photo randomly, Nadine was still able to smile for the camera! I'm guessing she has the "camera-radar" turned on! What I like about MYOH is the fact that you can see other people's creativity through how they customize their own havaianas pair. 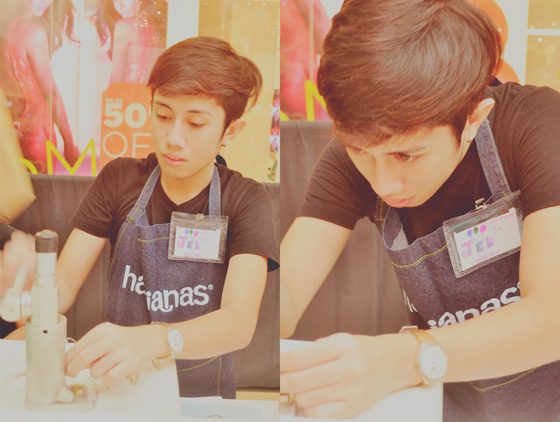 I find it really fun and interesting whenever people tend to exert much effort in "perfecting" their havaianas. So, this is my JASSIEfied pair number 1! Salmon soles with gold straps and ribbon pins! During the sneak peek, I really had a rough time deciding which pair I should get this year. If it were only possible to get ALL flip flops...drats. Look who's also part of this year's MYOH. 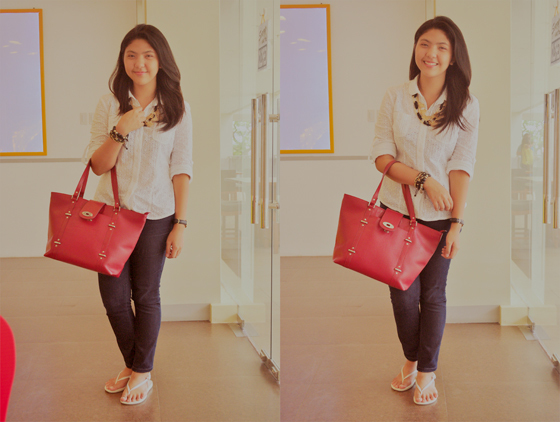 Fashion Blogger, Mia Durano's here! It was so nice seeing my friends in the event. I wasn't able to chit-chat with them since I might bother them in their work. Regardless, I really am grateful to see them. 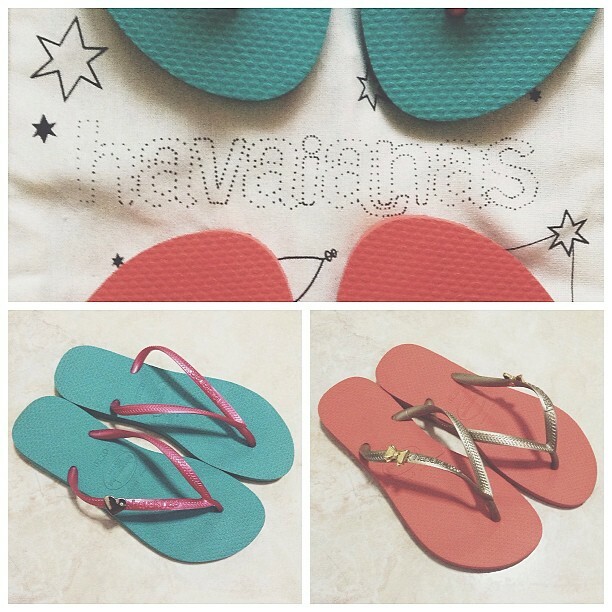 Who can resist a wall full of havaianas flip-flops? Tell me! For a fact, I know I can't. Like I said, Nadine's camera radar's on! These are the pairs I JASSIEfied during the event! Thanks to SprucePH for giving me a free pair! I would love to blab more stuff about the event but it'll really take too much time, so I thought of showing you guys a short video clip during the event! I'll be looking forward for next year's MYOH! Here's my "Milk-tea-buddy-bud". He never fails to accompany whenever I want to drink milk tea! No one else was in Happy Lemon that time because it was still so early. So, I took the liberty of doing some outfit shots! And yes, I don't know what EMBARRASSING means. 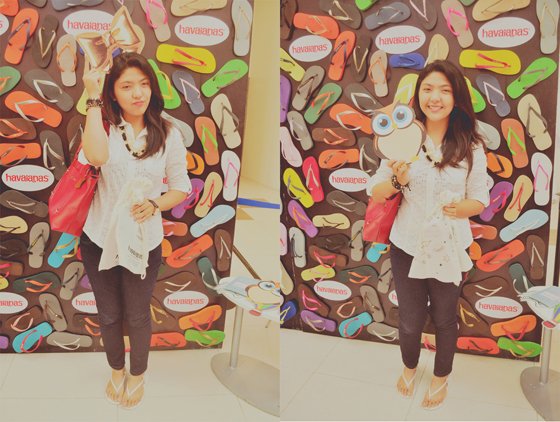 I wore my old white Havaianas sling back to fit in to the MYOH event. I've had this for quite some time now but I haven't used it that often because my mom uses it more than I do. This is my latest red Our Tribe bag. When my parent's left for Bangkok, they brought me home a present from my hometown. Since there's no Our Tribe store here in CDO, I could hardly get my hands on a new bag from that shop. If you guys are looking for a bag that'll last, check out Our Tribe's FB page! I'm obsessed with gold, black, and chained accessories lately. I'm currently loving those necklaces! I'll end my post here guys. 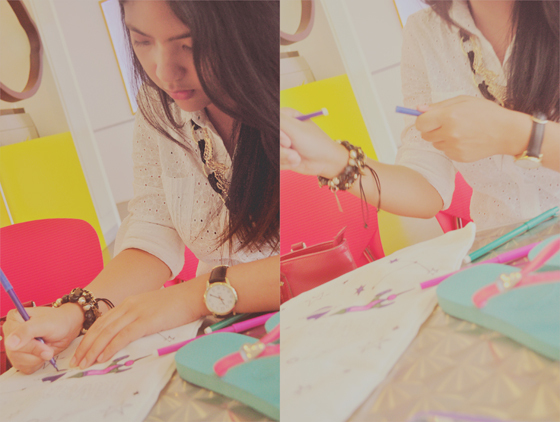 Check my blog soon for more posts! For my next entry, I might do a "What's in my bag?" or "What's on my ipad?" post!